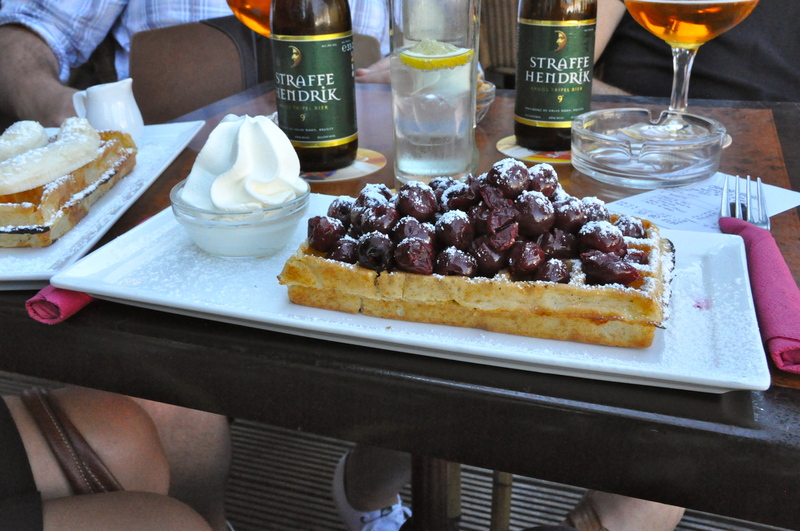 Everyone has heard of Belgian waffles. Growing up, we had a special “Belgian waffle” mix instead of “regular waffle” mix. I thought they were just slightly sweeter. However, my husband has to travel to Belgium quite frequently for work. Before our official move to Geneva, he lived in a hotel room in Ghent for about a month. 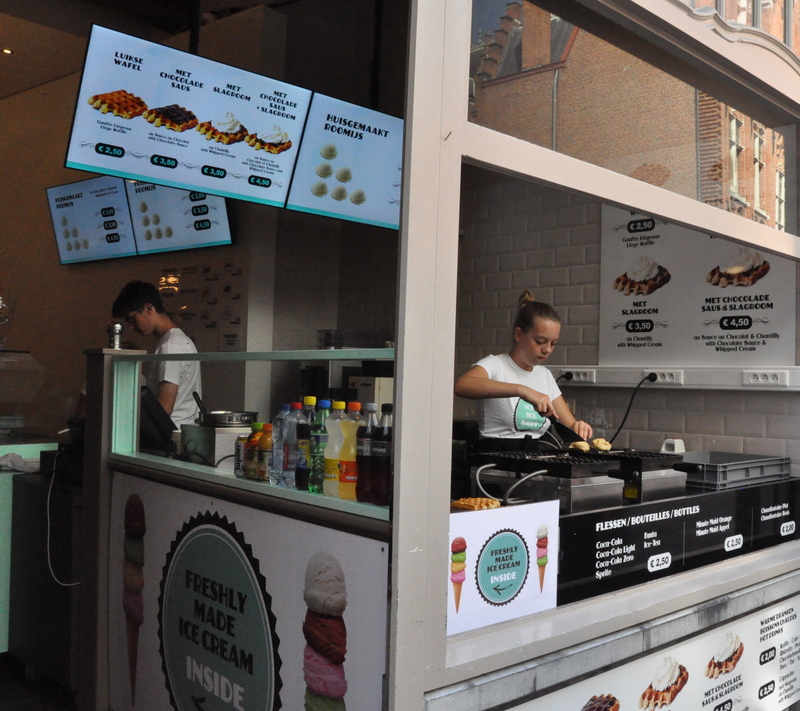 And he was able to taste some of Belgium’s best waffles. He bragged about how delicious they were, a special formation of crunchy and light. And best drowning in chocolate. How much is that wafffffle in the window? The one with the chocolately trail? 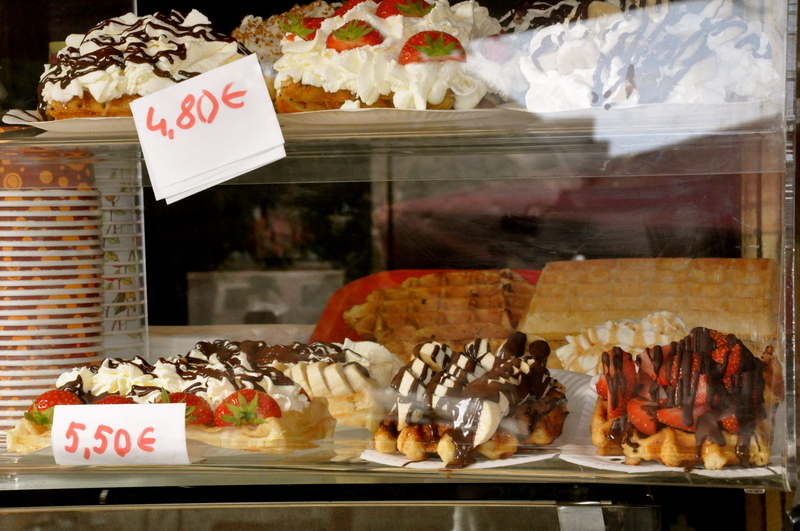 He made me jealous enough that I added Belgium to my “must visit” list so I could try these waffles. And, we finally made it, alongside Ferdinand & Isabella. 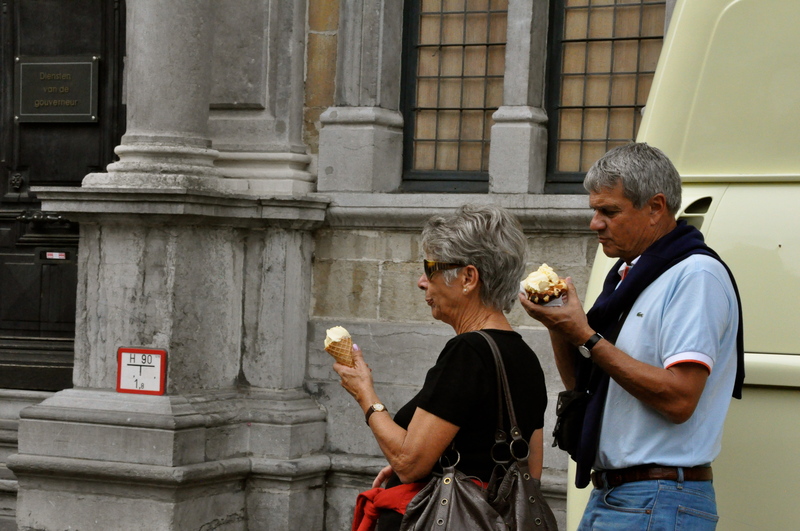 Isabella & I had one within our first 30 minutes of being in Brugge. While the boys had beers, we preferred our calories covered in fruit. 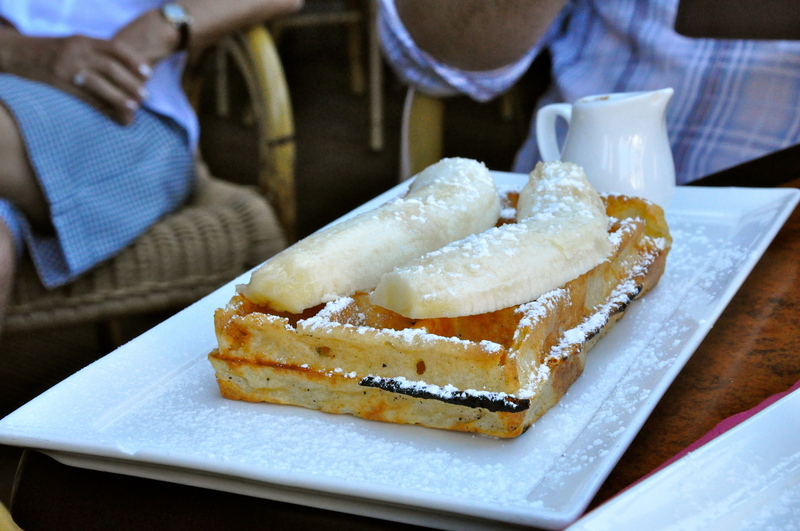 Isabella’s waffle – chocolate & banana. My waffle. Cherries & whipped cream. And it continued the next morning. 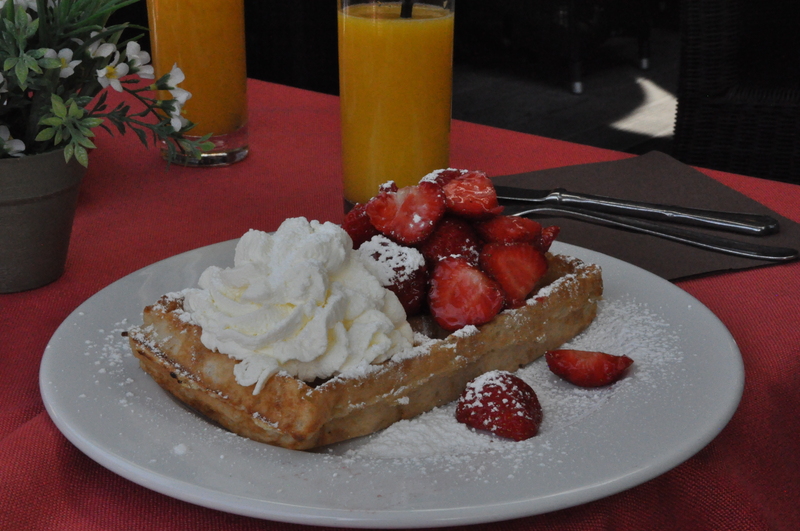 You aren’t really supposed to order waffles for breakfast, but we wanted waffles no matter what time was ‘typical’. For goodness sake, we were only staying in Brugge 36 hours. There wasn’t any time to spare! My breakfast waffle. Strawberries & cream. Even with two under our belt, Gabe still protested we hadn’t had a real one yet. We needed one off the street. Studying the street vendors, I saw what he meant. And doing so, I think I learned Belgium’s secret. 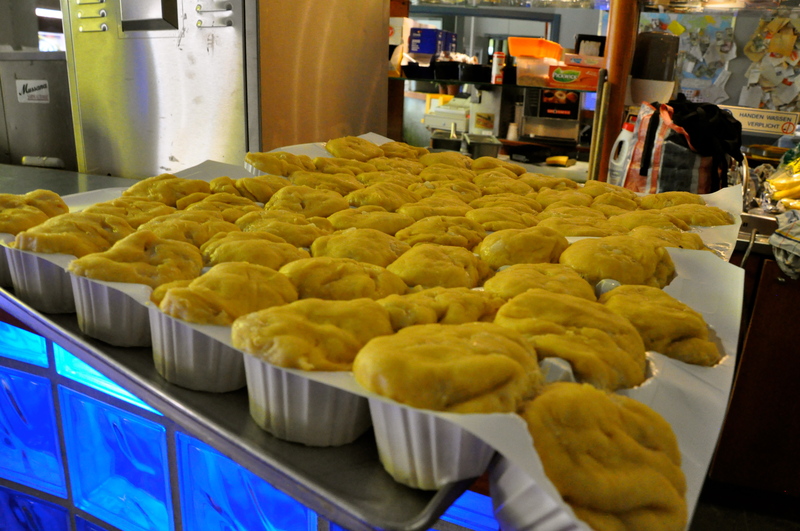 The batter is more like a hunk of dough than a liquified batter like we use back in the USA. There is one of these on every corner. Waffle batter is more like dough. Waffle cone for her. A whole waffle with ice cream for him. Isabella and I split one when we returned back to Brussels, from a little stand near Grand Place. And we agree….street ones are the BEST! In addition to fresh waffles, Belgium offered many beautiful packaged versions. I am glad because when I start going through waffle withdrawal, I know it might be possible to order them online.